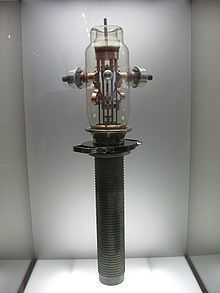 Lee De Forest invented the device that made wireless radio broadcasting practicable: the "triode" or "audion" amplifier. At Yale University, De Forest helped pay his tuition with his mechanical and gaming inventions. He narrowed his focus to radio when he began working on his PhD, which he received in 1899. In his research, De Forest began to conceive of an improvement to the "diode" vacuum tubes being used at the time. Those diode tubes maintained an electromagnetic current between two electrodes, an anode (positive) and a cathode (negative). They were not subtle enough to respond to changes in incident electromagnetic radiation; and they could "rectify" signals (from AC to DC), but not amplify them. By 1906, De Forest had found a simple but ingenious solution to these problems: he added a third electrode between the other two. De Forest's patented "triode" or "audion" tube could both rectify and amplify; and its greater control it meant that various electronic circuits would finally be commercially feasible. De Forest, who had first predicted the possibility of radio broadcasting in 1902, now founded a company (1907), in order to make commercial radio a reality. However, despite successful public demonstrations by De Forest and some other scientists, the public was skeptical. In fact, the US District Attorney sued De Forest (in 1913) for defrauding his shareholders with what it called "absurd" promises. But De Forest persevered, and in 1916 had two triumphs: the first radio advertisement (for his own products) and the first presidential election reported by radio. De Forest's achievements go even farther than his nickname, the "Father of Radio," implies. By the end of his career, he had earned over 300 patents. His audion tube became an essential component of not only commercial radio, but the telephone, television, radar, and computer. Although solid-state transistors replaced the bulky audion tubes originally used in these devices long ago, Lee De Forest's inventions and enthusiasm paved the way for the electronic age.